The new edition of the classic power pop album NO MORE NO LESS is one of the best reviewed reissue releases of 2008. Explore THE BLUE ASH BAND BLOG here on the Lost in the Grooves site, buy tunes from their compilation AROUND AGAIN, or click below to get the album reissue. 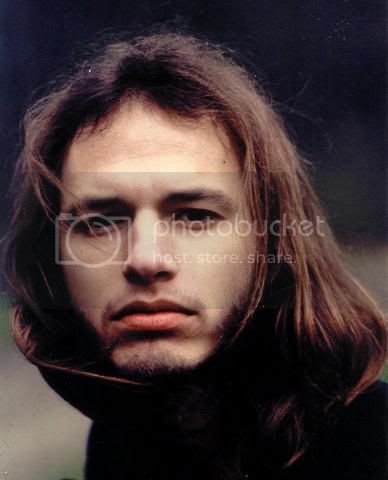 Garland's self-titled debut CD is a featured Lost in the Grooves release. Click here to sample the music or purchase. Garland was recently selected by store staff for Amoeba Music's Homegrown series, where a a notable local act is promoted with in-store displays and ads in local papers. With their stunning vocals, shoegaze guitar shimmer and fragile electronic ballads, Garland's sound is rich, emotive and distinctively its own. 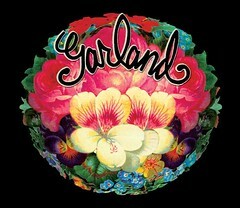 You can visit with Garland on MySpace here. 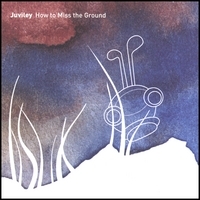 Juviley's debut CD How to Miss The Ground is a featured Lost in the Grooves release. Click here to sample the music or purchase. Juviley is the project of Israeli musician Or Zubalsky, who toured widely with Israel's leading indie acts Shy Nobleman, Geva Alon, Daphna & The Cookies. At 21, he began writing his own songs, and revealed a tender, delicate sensibility far removed from the stereotypical dumb drummer. Inspired by the chamber pop of Brian Wilson, Nick Drake and Belle and Sebastian, on his debut album How To Miss The Ground Or plays nearly every instrument himself. With its heartbreaking simplicity, bittersweet melodies and thoughtful arrangements it creates a unique, dreamlike atmosphere. Once the record was completed, Or moved to New York City, where he plays regularly, in clubs and on the streets. The critics love Juviley's How To Miss The Ground. Palebear muses, "I sort of needed this album to right my sanity… beautiful, pastoral… equal parts Kings of Convenience, Mojave 3 and Belle and Sebastian." And Caroline Leonardo says it's "an articulate collection of songs sure to warm your soul with pleasant melodies and story-like lyrics… an acoustic dream with the kind of tunes that'll lift your spirits during a rainy day… [it] is one of those rare debuts that carry a lot of clout. This well orchestrated album comes off gentle and well meaning without being pretentious or overbearing in the way that it's so simple and true. Indie pop has never sounded so good." You can also visit with Juviley on MySpace. Birth. School. Work. Music. Mike Appelstein’s life in St. Louis. Check out my blog about Judaism. Author litgwp_tl361rPosted on October 11, 2016 Categories Uncategorized1 Comment on Hello world! Your assignment today is to gather together in one medium-sized concert facility, for one evening only, one dozen of the worldâ€™s most popular entertainers. Age, style, size, corporate affiliation and particularly musical pigeonhole is to be strictly of no concern whatsoever. Each act just has to have had a heck of a lot of their songs downloaded, perhaps maybe even sold, over the past calendar year or so. Then, with a bare minimum of rehearsal or directorial guidelines of any sort â€“ and an equally bare-boned budget to boot â€“ a two-hour concert has to sequenced, scored, choreographed and executed upon a single stage utilizing all these chosen singers, dancers and accompanists, the entire proceedings recorded and videoâ€™d completely live, music and vocals, without re-takes, and the resultant miles of tape then edited, printed, promoted and distributed for public viewing into theatres. Oh. And this all has to be completed within the period of a mere fourteen days, from show-date to release-date, by the way. Finished laughing? Of course in a 21st century scheme of things such an endeavor would scarcely get past the imagining stage I agree, quickly dismissed out-of-hand (not to mention out-of-mind) as completely unfeasible; one legal, logistical â€“ not to mention ego-tistical â€“ nightmare of gargantuan proportions. But, in that strange and distant galaxy known as The Sixties, where anything seemed possible, everything was tried at least once, and â€œnoâ€ was a word only uttered when speaking to people over thirty, undertakings of such grand socio-musical import were thought no more impractical than, say, making orange juice out of freeze-dried crystals then flying with them all the way to the moon and back. What is hard to believe, however, is that one such concert event filmed inside the Santa Monica Civic Auditorium on the night of October 29, 1964 in front of a few hundred local high school students should not only survive to be released on DVD, but that its one hundred and twelve monochrome minutes remain as utterly entertaining, and downright engrossing, all these forty-five years later. I will go all that one further, however: The TAMI Show (as in Teenage Awards Music International, by the way) is absolutely essential viewing to anyone and everyone who consider themselves fans, followers, and/or students of popular music. Allow me to elaborate. 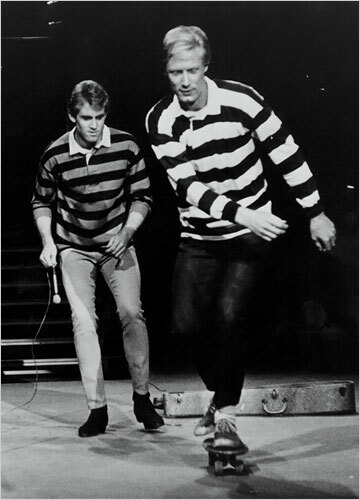 The dozen acts, co-hosts Jan and Dean sing whilst skateboarding across the opening credits, did indeed come â€œFrom All Over The World.â€ Not to mention everywhere across the musical map as well: Kicked off by â€œthe guy who started it allâ€ as Jan (no relation) Berry announces, Chuck Berry duck-walks us all the way from St. Louis to New York City, where the about-to-be- renovated Brill Building sound is sung most proudly and loudly by none other than Lesley Gore (whose proto-feminist lyrics and attitude herein should have all you brand new Runaways fans repositioning the birth of grrrl-rock once and for all). 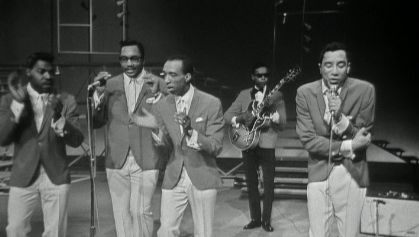 The magnificent Motor City is then represented by Smokey Robinson â€“ pay particular attention to his Miraclesâ€™ dance-steps during â€œMickeyâ€™s Monkeyâ€ â€“ along with superstars-in-waiting Marvin Gaye (who performs two songs soon to be recorded by a waiting-in-the-wings Rolling Stones) and The Supremes (poised to leave behind forever their branding as â€œthose no-hit Supremesâ€ with an historic string of global million-sellers). Meanwhile, England swings Santa Monica via Billy J. Kramer with his Dakotas plus Gerry and the Pacemakers (â€¦four of impresario Brian Epsteinâ€™s other clients unfortunately occupied overseas at this point in time, putting finishing touches onto Beatles For Sale it seems). Why, even what we now know and love as that runt of the musical litter, Garage Rock, is represented by none other than the aptly-named Barbarians and their, I kid you not, one-handed drummist Victor â€œMoultyâ€ Moulton. Plus special note must here be made of The Beach Boysâ€™ four-song set, propelled practically through the roof by their drummer Dennis, as this particular footage was removed from most every existing print of The TAMI Show soon after release and has only now been fully reinstated in all its harmony-drenched, sun-kissed, Surf City splendor. And then! 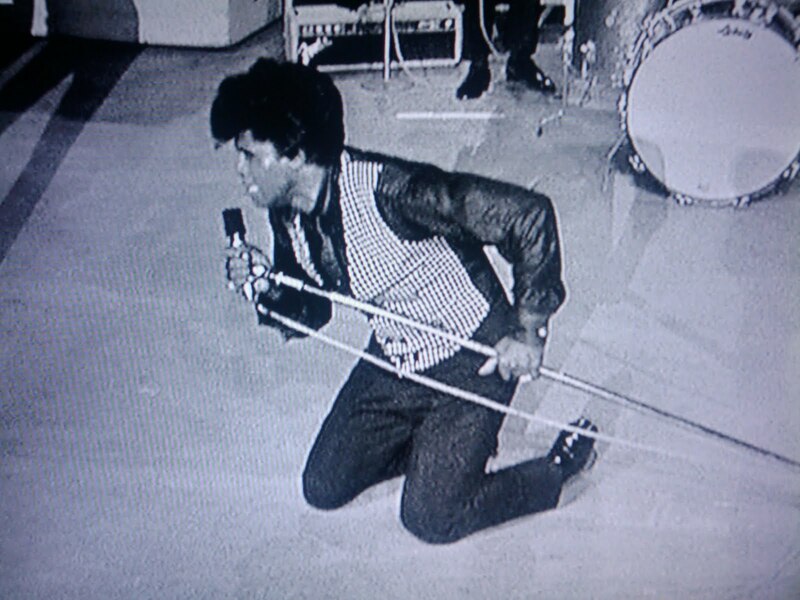 As impossible to pin down geographically â€“ not to mention musically or even vocally â€“ as he remained for the rest of his career comes the one, the only, the hardest- working James Brown. Now itâ€™s been said before, but Iâ€™ll just have to say it again (and again and again): His performance in The TAMI Show remains one of the most jaw-dropping, above-kinetic, gut-and-thigh-ripping performances ever executed. EVER. Anytime, any place, by any one. Everything you may have heard about this man and these particular eighteen minutes (e.g., â€œthe single greatest rock â€˜nâ€™ roll performance ever captured on filmâ€: Rick Rubin) is absolutely, one-thousand-per-cent true. Just look at it yourself if you donâ€™t believe me â€¦or everyone else who has ever seen it. 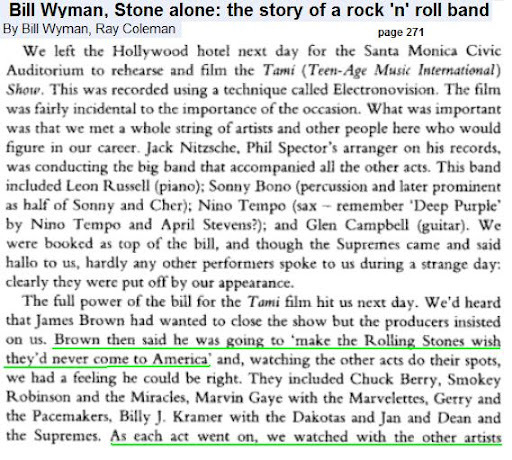 Somehow, those newly-rolling, original Stones â€“ with Brian Jones and even Bill Wymanâ€™s vocal mic present â€“ arose to the task of following Butane James that fateful night, and their performance closed the event, and the film, with a mixture of pure, simply pimply beat â€˜nâ€™ soul which wins over even many of the pole-axed teens whoâ€™d just survived James Brownâ€™s set. Finally, cue the entire cast and assembled dancers (watch closely for a very young Teri Garr!) back onstage to frug a mighty big storm up around Jagger and Richard(s) and, scarcely two hours after it all began, the curtain drops. So, just another night of music, mayhem, and undeniable magic out in L.A. during the fall of â€™64, right? But what novice director Steve Binder and his crew captured, and what today is immaculately preserved upon The TAMI Show DVD, is busting-full of rich musical (I repeat: James Brown) and cinematic (Diana Rossâ€™ eyes literally filling the screen during â€œWhere Did Our Love Goâ€) moments which have been oft-shot by everyone from Pennebaker to Scorcese since, but never truly duplicated. For what TAMI managed to mount and maintain all those years ago irrefutably remains the highest of bars for concert events, and films thereof, to reach even today. It may, sorrowfully, have taken nearly half a century to make it into our homes, but this film has not returned anew one single frame, nor scream, too soon. You have never seen, nor heard, ANYTHING quite like this before…..
â€œNo more Beatles! No more Stones! We just want the Viletones!â€ went the cry of true teen angst â€˜round my Toronto neighborhood circa the Summer of Hate, 1977. And, memories of my favorite punk-rock combo from a misspent youth notwithstanding, I do find myself feeling very much the same these thirty-three-and-a-third revolutions later as big Beatle box sets and Rolling Stone re-issues continue to dominate our collective, sonic rear-view. Of course I can still thrill to a remastered (mono!) â€œShe Loves Youâ€ as much as the next boomer, and glimpsing Hendrix backstage inside that Get Yer Ya-Yaâ€™s anniversary bundle will always raise a grin or two. But surely, surely there must have been something going on during those scant weeks between 1963 and 1969 when Lennon, McCartney, Jagger and/or Richard compositions werenâ€™t sitting atop the worldâ€™s hit parades. Well, finally, someone â€“ namely those utterly fab folk over at Reelinâ€™ In The Years â€“ have seen fit to shed light upon some of the other mop-tops whose sounds and styles filled our six-transistors and Sunday evening Ed Sullivan shows. 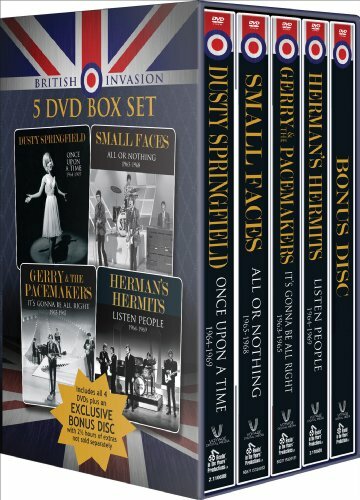 Yes, the first four editions of whatâ€™s promised to be an entire British Invasion series of DVDâ€™s are, you bet, here at last, spotlighting Dusty Springfield, Hermanâ€™s Hermits, Gerry and the Pacemakers and the Small Faces. And what audio/visual treats these discs are! Meticulously researched and packaged, expertly restored and annotated and whenever possible hosted by many of the actual participants themselves, the songs and stories flow in never less than quick, LOUD frenzies so perfectly reminiscent of those once-Swinging Sixties themselves. So, wherever to start then? How about Gerry Marsden fondly recalling the very birth of the Liverpool Sound in the kind of detailed â€“ sometimes most candidly so â€“ way no Beatles Anthology would ever dare to. Or a self-admittedly â€œnumbâ€ Dusty Springfield deplaning into Australia only to be accused of being â€œkookyâ€ and a spokesperson for â€œthe hippie philosophyâ€? Elsewhere, not at all coincidentally perhaps, we discover the hitherto-unknown connection between comedian/philosopher Lord Buckleyâ€™s spiritual Nazz and the Small Facesâ€™ ritual Methedrine, plus learn that it was in fact Peter Nooneâ€™s seemingly innocent rhythm section who schooled Keith Moon in the fine art of Holiday Inn â€œredecoratingâ€: why, watch closely and youâ€™ll even spot actual Super 8 footage of pool-side, long underwear-festooned Who/Hermits hi-jinks deep within the Bonus Footage! Interestingly though, from the wealth of treasures spread across these discs, I was most pleasantly shocked to witness downright incendiary footage of the Small Facesâ€™ Marquee Club debut, March of 1966. While for all the world looking, dressing, and acting like little more than a Cockney Monkees with cooler hair, trapped from the get-go inside these lads was apparently a solid, fighting-tough beat â€˜nâ€™ soul combo whose only Caucasian rivals at the time would have been those Young Rascals themselves. Who knew? (and then stay closely tuned for an extensive Colour Me Pop performance of their masterwork Ogdenâ€™s Nut Gone Flake complete with â€œHappinessâ€ Stanley Unwinâ€™s narration, I kid you not). â€œNone of us knew how good and how ahead of our time we were,â€ Small Face Kenney Jones admits herein, and that statement could rightfully serve as the modus operandi behind this entire series. Because, you see, The British Invasion, for the very first time ever, delves so very deeply into the hitherto-unexplored â€œsecond tierâ€ of mid-Sixties U.K. talent, and in doing so paints most vividly an indelible picture of the eraâ€™s myriad musical and social upheavals. And in a way you just wonâ€™t get from any existing thumbnail study or PBS pledge special, needless to say. Dusty Springfield: Once Upon a Time, Hermanâ€™s Hermits: Listen People, Gerry and the Pacemakers: Itâ€™s Gonna Be All Right and Small Faces: All Or Nothing are available separately or, even better, housed together with two and a half full hours of additional Bonus Disc interview and performance footage as a five-DVD collectorâ€™s set. Either way you take them, each deserve to be seen and heard repeatedly by any Merseybeating fan or serious student of rock â€˜nâ€™ roll â€¦or even for someone who just needs to know the correct way to toss a cherry bomb down a Holiday Inn toilet. Still in a most list-ful mood, but this round-up certainly wasnâ€™t a very easy one to compile, Iâ€™ll have everyone know. The pickinâ€™s were extremely, uh, thin, to say the very least. Nevertheless (or should I say Nevermind)â€¦.. Powerful pop most firmly rooted within the Brill Building anteroom. Americaâ€™s once-and-forever First Family of Song leave no Partridge unspurned. Just to make sure the Nineties werenâ€™t ALL Pet Sounds re-issues. Wherein the former Soviet Union signs its first Western act, then promptly dissolves. Rick Rubin produces a Johnny we thought only Sam Phillips could. Includes possibly definitive readings of â€œEve of Destructionâ€ and â€œRebel Yell,â€ I kid you not. Oh-so-effortlessly crosses ABBA, Sabbath, and Whoâ€™s Next â€¦and all by way of Jellyfish. Those Prefabs go out on a very high note (which, Iâ€™ll have you know, they played ALL BY THEMSELVES). Former head Cheepskate most definitely goes for baroque. Proof very positive: The greatest live r-n-r band In The World. Before Ali G, Baba Booey, and most definitely Tenacious D.
Truly too cool â€“ not to mention loud â€“ for (many) words. For once, the title says it all. More than filling that cavernous sonic gap between SMiLE and the XTC reunion. Hank Williams visits The Cavern by way of Big Pink. Includes â€œBring Me The Head of David Geffenâ€ â€¦and then some. Upstate New Yorkâ€™s finest give their Stones cloning a rest whilst hanging all ten. So many Jandek albums; so little space. Yeah, she's a doll alright, butÂ you ain't gonna hear her music just by staring at her. 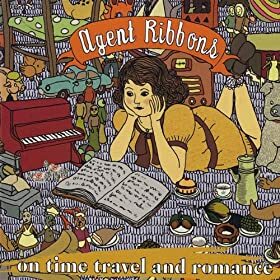 That's why I'm here to let you know that Agent Ribbons' debut release On Time Travel and Romance has given Sacramento another reason to be proud of its homegrown musicians. It all began when Natalie befriended Lauren Hess in a downtown used record storeÂ (which happens to be the very same store featured on theÂ cover of DJ Shadow's magnum opus Entroducing . . .Â )Â This meeting of minds gave Natalie a renewed interest in her musical ambitions and inspired her to form a band (Ã la Art Brut) with Lauren sitting in on drums. Agent Ribbons has a decidedly retro sound thanks to Natalie's focus on vaudeville, cabaret,Â and blues traditions in her songs, but she still manages to put a contemporary spin on everything she touches. Writing stories about looking for love after death and running off to join the circus, Natalie has a talent for dishing outÂ the whimsy without ever sounding overly cute.Â And her vocal on "Birds and Bees" is so hypnotically sensuous that it's become a permanent fixture on my profile on MySpace. Natalie and Lauren welcomed violinist Naomi Cherie into the mix in 2009 and recorded a forthcoming follow-up called Chateau Crone, so it seems they're all set to prove they're not just one-trick ponies. Sadly, the ladies haven't been able to make ends meet in their hometown and will be moving to Austin this year with the hope of greater success. With Natalie's promise of frequent visits to Sacramento, I wish them all the luck in the world! You can find Agent Ribbons' On Time Travel and Romance for sale here. Despite an alarming amount of critical mass to (and by) the contrary, there truly was much, much more worth hearing this decade just past than those big Big Star, Beatle, Bob Dylan and even Neil Young box sets. So then, strictly alphabetically speaking as always, hereâ€™s what I spent much of January 1, 2000 through December 31, 2009 listening very closely toâ€¦..
Tatsuya Namaiâ€™s radiant pop of the Daniel Johnston-meets-Shonen Knife variety. Hopefully Mr. Brennan will be duly hired to give the Beach Boysâ€™ catalog that Beatles Love treatment when the time inevitably arrives. 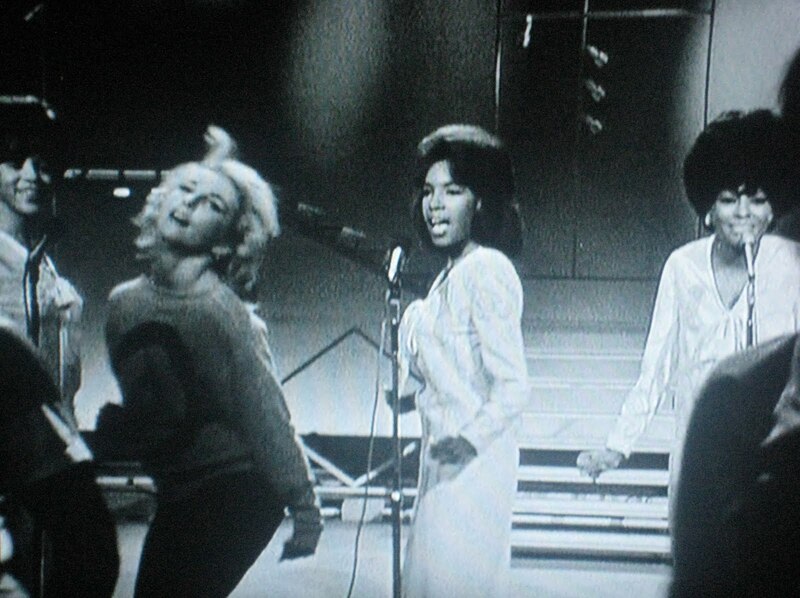 Ronnie Spector fronts Elvisâ€™ Attractions â€¦and THEN some! What Jason NeSmith and Kay Stanton did on their holidays in New York City. Remarkably sounding better â€“ and louder â€“ than ever. The album Brian Wilson has been trying to make since at least 1986. A sonic sequel to one of the Ninetiesâ€™ undeniably greatest albums â€¦and artists. Edges out Christmas In The Heart by a mere Santa whisker. Proving you can have your re-heated soufflÃ© and eat it, too. Wherein Atomic Jones meets Wyclef Jean â€¦by way of â€œBlack Bettyâ€ ! Fifteen more examples of most potently powerful pop, Nashville-style. Tim Boykin and his ever-bright l-o-l-a Lolas honestly do make the kind of records you still think Paul McCartney does. The sound of the hardest-working drummer in Canada loading all six strings. Forever more than happy to play the Stones against their countrywomen Puffy (AmiYumi)â€™s Beatles. Just as if Bobby Fuller and those once Flaminâ€™ Groovies were never ever extinguished. The definitive alternative to alternative country. The nice, nice noise that simply continues to keep on giving. Exactly as if Brian Epstein had never entered The Cavern. Wherein George Harrison and even F. Zappa receive the Bacharach and David by way of Todd Rundgren treatment. Canadaâ€™s Ramones finally reunited with their very-long-lost brudder. Bring On the Twenty-Oh-Teens !!! Telekinesis! (self-titled) Irresistible power pop, â€œCoast of Carolinaâ€ an instant classic. The Soundcarriers–Harmonium Soft and breezy with a little electronica thrown in, something like Stereolab/Broadcast but with a more direct nod to soft psych from the â€˜60s. Jah Wobble-"Get Carter" (single) Anyone who knows me knows why Iâ€™m interested in this. But, Ted Lewis connections aside, this is an inspired interpretation of a timeless movie theme. The Flaming Lips–Embryonic A mood-driven record where the overall feel is the point, rather than individual songs; itâ€™s the Lips doing Prog, and they do it in masterly form. The Clientele–Bonfires on the Heath The same kind of majestic, lush psychedelia that had our jaws dropping when Suburban Light came out nine years ago. The Raveonettes–In and Out of Control Ramones songs told as ghost stories. This record is both throwaway and brilliant; gets better with each listen. New Dawn–Thereâ€™s a New Dawn Lost classic from 1970 out of the Pacific Northwest. Pothead lyrics and fuzzed-out guitar. Emitt Rhodes–The Emitt Rhodes Recordings (1969-73) Rhodes is one of the great unheralded songwriters in pop music history; these four albums are gems showcasing sparkling power pop and gentle psychedelia. The Apples in Stereo–#1 Hits Explosion 16 choices tracks from the Apples recorded output up to this point. Makes you want to do cartwheels while singing along. Roy Loney & The Phantom Movers–A Hundred Miles an Hour 1978-1989 The one-time Flaminâ€™ Groovies frontman kept the Grooviesâ€™ greasy, rockinâ€™ spirit alive with the series of records he made after leaving them. Spirit–Fresh From the Time Coast: The Best of 1968-77 One of the most innovative bands on the late â€˜60s SoCal scene, Randy California and friends continued to make compelling, jazz- and folk-tinged psych into the late â€˜70s. Big Star–Keep an Eye on the Sky A four-CD treasure of recordings done by one of the most influential bands ever. All the stuff from the three main albums, yes, but also a stunning live show from â€™73, a handful of revelatory pre-Big Star sessions, and alternate versions that are actually worth hearing. Nirvana–Live at Reading A great band playing live when at their very peak. The Paupers–Magic People Psychedelic folk rock from Toronto, 1967. Part Beau Brummels, part Buffalo Springfield, part Lovinâ€™ Spoonful. Funkadelic–Standing on the Verge (Best Of) Faultess, one-disc best of Funkadelic that covers their full output, 1969-79, early acid rock to later acid disco. T. Rex–Spaceball (The American Radio Sessions) T. Rex doing spots on American radio, 1971-2.